Celebrating 15 years of presenting Montréal audiences with some of the best genre cinema from around the world, this year’s Fantasia International Film Festival takes place from July 14-August 7. Bas-Fonds (France, Director: Isild Le Besco): French actress Isild Le Besco wrote and directed this brutal tale of three young women living together and fulfilling their basest desires until it leads to an explosion of violence. To be honest, the full description from Fantasia scares me a little. Clown (Klovn) (Denmark, Director: Mikkel Nørgaard): Based on a Danish television comedy series, this sounds right up my alley. Two friends go on a debauched canoe trip after one finds out his girlfriend is pregnant. Hoping this might be a bit like the Icelandic film Bjarnfreðarson (review). Love (USA, Director: William Eubank): Another scifi film about a solitary astronaut far from home, this sounds interesting because he finds the diary of a Civil War soldier and becomes convinced that this book has something to do with the lack of communication from Earth. The Whisperer in Darkness (USA, Director: Sean Branney): From the same filmmaking collective who brought you The Call of Cthulhu, perhaps the best H.P. Lovecraft film adaptation yet made. From that short, the H.P. Lovecraft Historical Society have learned their filmmaking chops and are back with their first feature, based on Lovecraft’s 1931 novella. The Old Ones are coming. Or maybe they’re already here! The Divide (Canada/Germany/USA, Director: Xavier Gens): I’m a sucker for a good post-apocalyptic thriller. Trouble is, there just aren’t that many good ones. In The Divide, eight strangers survive the end of the world in the basement of their apartment building. The Divide is described in the Fantasia catalogue as Lord of the Flies meets Threads, which raises my hopes. There are a bunch of other great films playing, like Attack the Block, Another Earth, and Bellflower, but trust me, those will be all over the place soon. And I’m hopeful that even if I can’t get to Fantasia this year, that the good folks at Toronto After Dark will bring some of these treasures home for us to catch in October. 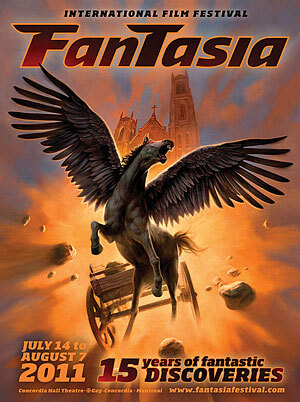 This entry was posted in Film Festivals and tagged #fantasia2011, fantasia, genre, horror, scifi. Bookmark the permalink.